As part of its total service concept, Karman operates its own fully-equipped in-house machine shop for the design and manufacturing of both prototype and production-run precision molds. Over the past 71 years, Karman's staff of tooling engineers has designed thousands of molds. 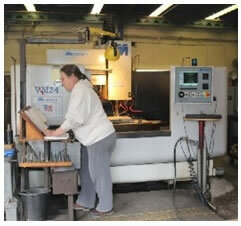 By having its own in-house mold and machine shop, Karman is able to assure its customers high quality and fast service. The ability to produce a prototype mold on short notice allows for quicker sample analysis and thus assures customers that their production runs can begin on time. What's more, Karman's in-house facility enables it to make last minute design changes or repairs and keep parts coming without delay.